The widow of a soldier who died in Niger earlier this month says a Facebook post circulating under her name defending US President Donald Trump is fake. Myeshia Johnson says the post criticising Congresswoman Frederica Wilson - who has been in a war of words with Mr Trump - was written by someone claiming to be her. 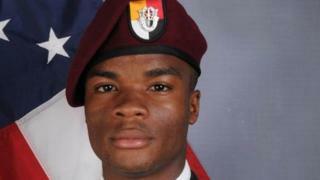 The death of Sgt La David Johnson received international attention when details of a condolence call made by Mr Trump were shared by Congresswoman Frederica Wilson. Ms Wilson said the president had told Mrs Johnson her husband knew what he was signing up for, and that the president's remarks were insensitive. Ms Wilson who represents a Florida district told WPLG, a Miami TV station she overheard the conversation on speakerphone before Sgt Johnson's coffin arrived in his home city of Miami. "To me, that is something that you can say in a conversation, but you shouldn't say that to a grieving widow," she said. "And everyone knows when you go to war, you could possibly not come back alive. But you don't remind a grieving widow of that." Mr Trump says Ms Wilson's allegations against him are false and later at a White House briefing, press secretary Sarah Sanders condemned Ms Wilson who she said had "politicised" the issue. At the weekend the story continued with a Facebook post, purportedly written by Sgt Johnson's widow Myeshia accusing Ms Wilson of using her husband's death to further her own political gain, being widely shared. "I'm getting sick of this politician using my husband as a political platform," read the post: "Even by her own words she did not hear all of the conversation she only heard part of it." On Twitter, the post had been attached as an image to a tweet that has been deleted but is still being shared as a screenshot. On Sunday ABC News said that Mrs Johnson did not write those words. ABC journalist Michael Del Moro tweeted confirmation of the now debunked post. He told the BBC: "Myeshia Johnson confirmed this post was fake to me in person"
Fact checking site Snopes explains that while the date of the post corresponds with the day President Trump made the call to Mrs Johnson, the time does not: "The time listed is actually more than an hour before the reported time of President Trump's phone call, which was 4.45pm Eastern time." In addition the profile picture shows a square image but Facebook introduced an update two months ago changing the shape of users profiles from square to round. As news emerged that the post had been fabricated social media users shared their views about the latest twist in the story. "Has Myeshia not suffered enough," posted one Twitter user. Another commented: "I knew it was fake. It sure didn't stop the idiots from thinking it was real and retweeting that garbage". While another Twitter user called for Facebook to take action: "FB must find who did this and the person or people behind it should be named. Absolutely disgusting."